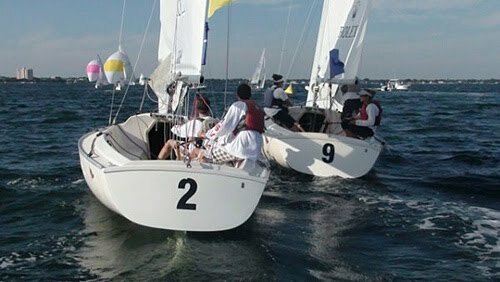 Today was a tricky day for our team at the US Match Racing Championships . We had a successful morning, and a bit of an unsuccessful afternoon. We finished the day 3-4. The racing was very close and the results are too, with second place only at 5 points. We had some very exciting, close races today that were a lot of fun. Win or lose, we enjoyed ourselves and learned a significant amount. Some things we learned for the first time, and others were just reminders of moves that we haven't seen in a while. One of our closest races was with Bill Hardesty where we tried a move on him that he did to us when we practiced earlier this year. It was quite ironic, but this time, we were on the wrong side of the call and ended up with a red penalty. It was too bad, but it was deserved, and we learned from the play. Another was with Taylor Canfield where the whole way around the race course we were within two boat lengths of each other. Tomorrow's forecast is for a little less breeze before it builds again into the weekend. We have two races left of the first round robin before we dive into the second round. We have plenty of racing left, and are looking forward to it. Racing starts again at 10am tomorrow morning, and will be live online through Kattack. You can also checkout the results at the regatta website.